Tom Williams concentrates on Investment Banking Services and providing client companies with management, turnaround and restructuring support. He brings substantial management and financial services experience to New Direction Partners, based on his history of success as President of P.C. Leasing Corp., Executive Vice President of PhoenixCor, Inc., Vice President and Portfolio Manager at GE Commercial Finance and Vice President, Sales and Marketing for U.S. Concord, Inc. 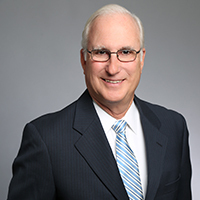 Most recently, Tom was Managing Director of DoveBid Valuation Consultants Earlier in his career, he held positions of increasing responsibility in sales, marketing and product planning with the Graphic Systems Division of Rockwell International Corporation. Tom holds an MBA from the University of Chicago and a B.S. in Graphic Arts Management from Rochester Institute of Technology. He is a member of NAPL’s Soderstrom Society and a past President of the International Printer’s Supply Salesmen’s Guild. He is active in community affairs, charitable organizations and trade associations and is a speaker and lecturer at association meetings, industry seminars and universities. Tom can be reached on his direct line at (610) 230-0635 ext. 704 or by email at twilliams@newdirectionpartners.com.